Lovely sea views across Mounts Bay to St Michaels Mount and beyond from this well presented two bedroom ground floor apartment which has spacious well proportioned living accommodation which would make an ideal retirement or holiday home, located in a quiet semi-residential area on the outskirts of Penzance. The lower apartment has been well thought out having spacious versatile accommodation in a much sought after area. The property is located at the end of a private road on the outskirts of Penzance within the grounds of a large gentleman's residence which has been divided to provide spacious individual apartments each having there own outside area with parking for two cars. The apartment has great scope and really needs to be viewed internally to appreciate to the full. KITCHEN AREA: Inset single drainer sink unit with cupboards below, a range of fitted base and wall units, work surfaces, power points, built in oven, four ring hob with extractor hood over, integrated fridge, freestanding dishwasher, cupboard housing gas central heating boiler. INNER HALLWAY: Built in cloak cupboard, tiled flooring with underfloor heating, sunken spotlights. SITTING AREA: 15' 7" x 6' 7" (4.75m x 2.01m) UPVC double glazed, tiled flooring with underfloor heating, sunken spotlights, UPVC double glazed doors to rear courtyard. 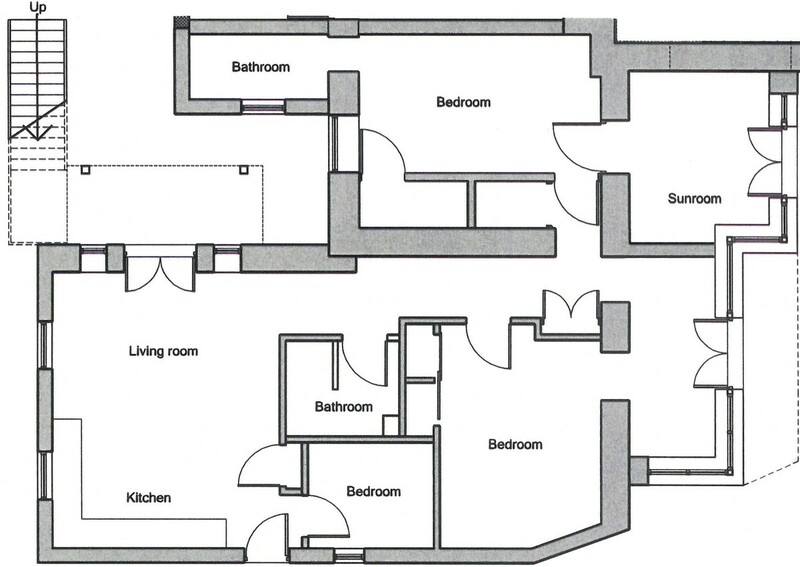 SHOWER ROOM: White suite comprising vanity unit with wash hand basin and cupboards below, low level w.c., glazed shower cubicle, tiled flooring with underfloor heating, sunken spotlights, chrome towel rail. N.B: The shower room can be accessed from the living area as well. BEDROOM 2: 14' 1" x 9' 5" (4.29m x 2.87m) Built in double wardrobe, sunken spotlights, walk in wardrobe, UPVC double glazed window, radiator. ENSUITE SHOWER ROOM: White suite comprising double sized shower cubicle, wash hand basin with drawer below, low level w.c., UPVC double glazed window, chrome towel rail. SITTING AREA: 11' 0" x 9' 7" (3.35m x 2.92m) Tiled flooring with underfloor heating, sunken spotlights, UPVC double glazed door to rear courtyard. OUTSIDE: To the front of the property is a brick paved parking area incorporating a sun terrace. To the rear of the property there is an enclosed courtyard. LEASE: The property has a new 999 year lease with each apartment having a share of the freehold. SERVICES: Mains water, electricity, gas heating and newly installed drainage to a private treatment plant (no council drainage rates).